^ 1.0 1.1 1.2 1.3 1.4 1.5 1.6 R.J. Bouwens, G.D. Illingworth, I. Labbe, P.A. Oesch, M. Carollo, M. Trenti, P.G. van Dokkum, M. Franx, M. Stiavelli, V. Gonzalez, D. Magee. 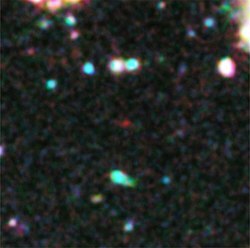 A candidate redshift z ~ 10 galaxy and rapid changes in that population at an age of 500 Myr. Astrophysical Journal. ^ 2.0 2.1 叶孤城. 哈勃观测到诞生于宇宙大爆炸后4.8亿年的星系. 科学网. 2011-01-27 [2011-01-27]. ^ Hubble finds a new contender for galaxy distance record. Space Telescope (heic1103 - Science Release). 26 January 2011 [2011-01-27].